Hi, welcome and "Servus!" from Vienna! 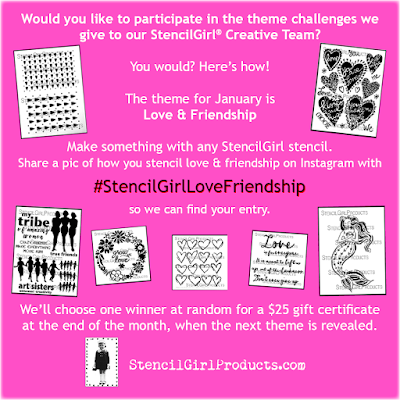 Love and Friendship is this month's theme here on the StencilGirl Talk blog and I decided to create a little gift for a beloved friend of mine who needs some love and encouragement as she is going through hard times at the moment. I guess we all know how hard times can affect our self-esteem, especially when they have come to stay with us for a while. And what makes it worse is the fact that we are surrounded by the media who try to make us believe that we only have to do (and buy!) the right things to always be young, full of energy, healthy, powerful...and perfect. But that's not true. Sometimes we simply cannot control what happens to us - especially when we are taken down by health issues. But as society spreads this wrong belief of us all having full control over our bodies and lives (if we just try and work on it hard enough and do the right things), we tend to blame ourselves if recovery is slow - sometimes we even start to believe that it is our own fault that we have become ill! During the last half year or so I have been watching my friend lose all her energy and self-confidence while she has been suffering from a deep depression after a severe nervous breakdown. Been there, done that too - so I know how important it is to have friends that make us feel important and - most important! - not forgotten - even if we have become quiet and have taken a long time-out from being social. I have also learned that it often helps to keep a journal in which to write down affirmative thoughts, about good moments and small goals we have already achieved on our way back to good health. So I decided to create a "You Can" journal for her that I will give to her when we next meet. The 6''x6'' stencils are my favorite size for gel plate printing as I have a gelli plate of the exact size. I started out with pulling some plain white and black sheets for backgrounds. I experimented with some other stencils as well, but wasn't content with the results of the prints - but I kept these and simply added a plain white or black layer on top. The result? Backgrounds that already have traces of patterns in them, which is perfect as this provides a lot of depth and interest. A print done with the Ski Lift Works stencil finished up one of these sheets. A black background print was used to pull a Zinnia print in white. I used DecoArt Americana Snow White (which is a wonderful liquid acrylic paint) and Lamp Black. I let the left over white paint from the previous print dry on my Gelli Plate and then added a layer of Lamp Black and pulled another print. ...this time the Wall of Words! And that led to another print that I did the same way as with the second Zinnia print. I simply added Lamp Black on top of the almost dried white paint from the previous print. As you can see I used another print that I wasn't content with for this. For it, I used the fab oval masks from the August 2018 Stencil Club Collection this time. I love that there's not just (boring) plain black visible with the oval shapes, but also the texture from the Wall of Words letters! Once I had a lovely little collection of black and white prints I picked six and die cut the Wrapped Journal cover from heavy grey board. The two spines were painted in Lamp Black DecoArt Americana paint on both sides. Then I cut the papers to size to glue them to my journal cover. The journal was finished up by adding a little red heart that I cut from a stenciled paper scrap. I also wrote "YOU CAN" with a fine tip PITT Artist Pen using the Wall of Words stencil again. The heart was traced with a white gel pen. Time to insert the two bought notebooks. I changed plans and used some rough white string instead of the black elastic ribbon. For the journal's closure, I poked a hole into the spine's center (right between the two notebooks) in which I threaded a red leather cord. A simple knot keeps the cord in place. I made sure the leather cord would be long enough to be wrapped around the closed journal three times. Another little red heart was added to the covers of the inserted notebooks. I love how the red heart pops from the beautiful black and white background! I didn't go for a colorful design on purpose, because the journal should have a calming look and support an atmosphere of mindfulness. And the lovely Zinnia helps from keeping the black and white design look too sober. Do you know how I can pin it to Pintdrest? You should be able to pin the project to Pinterest if you have installed the pinterest application on your device (go to Pinterest and download)...then there should be a red icon in the upper left corner or center of the image you would like to pin and you click on it. Hope that helps. Wonderful project - I love how it turned out, and love your black and white prints! Thank you both so much, Terry and Lynette! So happy you like my journal! This is super gorgeous! I love this free artsy look, so well done and the touch of red really just makes it special. What a wonderful project. Nice tutorial. TFS! very nice!